Last night at the beautiful Grade One listed Town Hall in Leeds, England, local hero Carl Johanneson faced Scottish challenger Ricky "Rickster" Burns for the British Super Featherweight Championship. 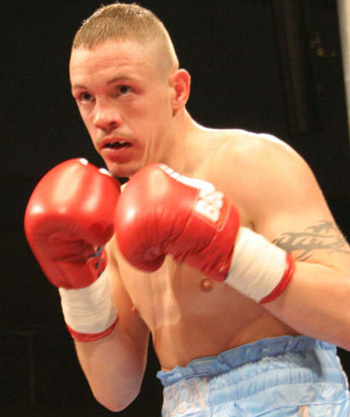 Blonde and tattooed, Burns entered the ring alongside longtime British boxing fixture Dean Powell while Johanneson came in wearing black shorts, flanked by cornermen Dominic and Brendan Ingle. Burns had been sparring with fellow Scot, former European Super Feather Champion Alex Arthur while British Champion Johanneson sparred with WBC Light Welter Champion Junior Witter and English Light Middle titlist Andrew Facey in preparation to this massive Frank Maloney Promotions showdown. Round one: Johanneson, the bigger puncher, flew out of his corner looking to impress the home crowd. Right from the start he tries to control the fight, drawing Burns into his style of trench warfare. Again, Johanneson tears out of his corner at the start of round two, and a surprised looking Burns has to stand and trade punches with the Leeds man. Johanneson keeps up the pressure throughout the round, throwing punch after punch. It’s a fast pace and Burns hasn’t yet gotten into the fight. A better round three for Burns as he finds his stride and settles in to the fight but Johanneson keeps up the pressure. Can Johanneson continue to pressure like this or will he burn himself out? There’s already a slight swelling around the right eye of Johanneson as he returns to his corner at the end of the fourth round. In the last minute of round five, Burns takes control for the first time on the bout but it's just briefly as he has Johanneson on the ropes. But the Scots’ nose is bleeding profusely as he finishes the round. Dominic Ingle works on the swelling above Johanneson's right brow during the intermission. 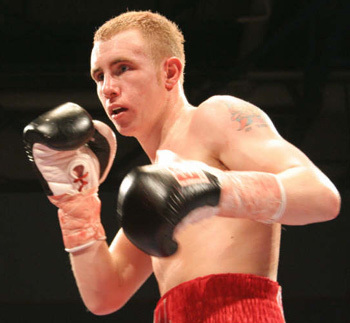 Apparently, Alex Arthur had said that if Burns survives the first six rounds that he will win the fight. Back to the action and referee Howard Foster warns Burns, his nose still dripping blood, for holding with a minute of round six to go. In round seven, Burns goes down a minute into the frame, following a left hook. The challenger looks tired but he digs deep and comes back to survive the round. Johanneson still keeps up the pace in the eighth, but has never been past eight rounds before. After a minute of round nine, Burns goes down again after a sickening body shot from Johanneson but comes back straight away with some good shots of his own. In the last 30 seconds of round 10, Burns goes to his knees after some punishing body shots. He gets back up, takes more punishment, then comes back again in the last few seconds of the round. In the twelfth and final round, Johanneson is looking tired after having set a gruelingly fast pace for this fight. In the last 15 seconds of the round, both boxers gambole over in the corner. When the smoke clears, Johanneson wins by unanimous decision, but Burns has shown real heart and gets the applause he deserved. Afterward, Johanneson said he "won it easy" and "I want Alex Arthur, give me anybody, I’ll win against anybody". The undercard at Leeds last night seemed to be following the same theme, ie. apart from one fight, they all went the distance. Previous Boxing News: Ricky Hatton Gives Up IBF Title!